uth Greenberg's parents warned against a career in art, but they also taught her to think for herself. So when Ruth brushed off the warnings and followed her ambition, she received their full support. A native of Connecticut, Ruth was the first American-born child in her family  her parents are from Denmark and South Africa. Ruth Greenberg needed to prove herself in New York City before Portland would take a chance on her. 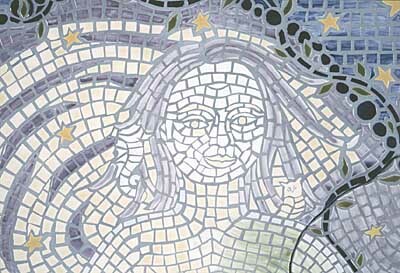 "When I started looking for mosaic work, I couldn't get the top design firms in Portland to hire me," she said. "So I took a trip to New York, hit the pavement, knocked on doors and found myself invited in. Now local companies hire me based on references from there." Prospective clients typically see Ruth's work through their interior designer, architect or a friend. Then, based on the style of their house, who they are, what they value and their interests, Ruth creates a custom design. "Often it is a somewhat collaborative effort with the client and the designer," she said, "but usually I come up with some ideas, draw them up and propose them. The client and designer say 'we love it, great, proceed' or 'we like this but could we have more of this and less of this,' or something like that." After the design is approved, Ruth cuts tiles from wet clay, fires, glazes and fires again. 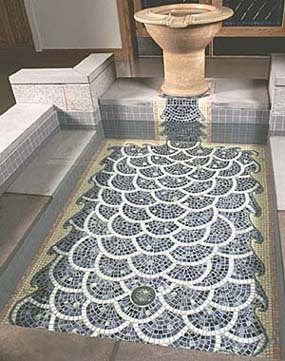 If the project is local, she then sets the mosaic on site; if it's not, she pre-installs it on a backing and ships it to the site so a local tile-setter can set and grout. Baptistry at Holy Family Catholic Church in Portland, Ore.
All of Ruth's work, averaging four pieces a year, is on commission. She now has clients all over the country. Since her art is installed on site, she doesn't show at galleries. "Much of the work I do is residential  fireplace hearths, backsplashes, murals, bath details  but I've done two university projects and a mural for a business." The universities are Yale and Rice. The Yale job came about because an architect was willing to take a risk with an unknown; Rice hired Ruth because of the Yale project. Last month Ruth and local sculptor Dave Laubenthal were chosen to collaborate on a public art piece for the Alberta Streetscape Project. Over the next year, they'll build a large tree that will be solar lit inside the branches, have a seat or two and be faced in mosaic. "I was really hoping for this one," she said. "Having a public art piece locally is pretty exciting." 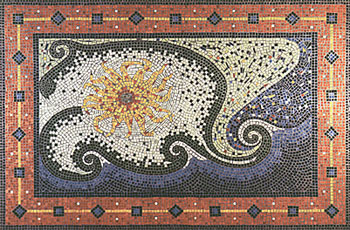 Direct inspiration for Ruth's work comes from ancient Roman mosaics in Italy and North Africa. Indirectly, she's inspired by Tiffany glass and her favorite artists: Vermeer, da Vinci, William Morris, Frank Lloyd Wright, Joseph Cornell, Hokusai, Jacques-Henri Lartigue, Matisse, many self-taught artists of the South and her father. "My father is especially involved and we often collaborate on projects," she said. 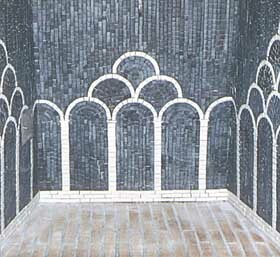 "He once commented that he wished there was a fireproof tile that could be used inside fireplaces. I spent two years creating just such a tile." Ruth's parents influenced her artistic life profoundly. Insisting that their children be independent, they left them to their own devices for entertainment. The five siblings combined a lack of TV with adept use of their imaginations and anything they could get their hands on to build forts, craft horses and sew dolls. "My mother tells me that I was using a pencil at seven months, but who knows," she said. "I do remember being very intimidated by my older sister's evident drawing talents and also by the high expectations my parents had of all of us. "Their mantra was 'it doesn't matter what you choose to do, but you must be the best at it," she said. "This often caused me to be too afraid to try anything risky, like exploring my creativity in a formal way  as in drawing, painting or trying to make a likeness of something. So I would close the door to my room and do my exploration in private. But even there I felt watched." Ruth took art classes in high school, though she didn't think her work was any good. "I did learn a lot, though," she said. "I had a great teacher who taught me how to get myself focused when I wanted to sit down and draw." Ruth stumbled upon her calling during her second year in college  after an internship in journalism and a few changed majors. She had registered for a film class, but on the first night all underclassmen were asked to leave because it was full. She replaced it with a pottery class on a whim, and on the first night changed her major to art. 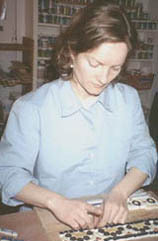 Ruth then took drawing, fiber arts, jewelry-making and "lots and lots" of ceramics. "My college offered a unique situation for me as an undergrad," she said. "The ceramics professor was world famous and very gifted. He was also the professor for the graduate ceramics program at an adjacent grad school, so the undergrad and grad students shared a workspace, and undergrads could sit in on certain graduate classes. "People from all over the world wanted to work with my professor, so he'd invite three or four working artists to the studio each semester. Visiting artists would teach the first semester each year, then he taught the second. I loved all of this because I was exposed to so many artists, techniques and a level of talent and professionalism that's rare to have as an undergrad." Ruth's introduction to mosaics came during the summer of her junior year when she received a grant and studied with a mosaic artist in New Mexico. "It was a blast," she said. "We'd spend all day tiling. She used broken tile to do a mosaic on the outside of her entire house, yard and fence. It was an incredible project that has since given her recognition and a sizable grant as one of the 10 unknown national treasures by the Smithsonian Institute. "But I still thought I'd pursue a career as a ceramic artist doing sculpture and some functional work." It wasn't until after Ruth had traveled for a while, gone back to school for a master's degree in education, moved to Portland and started her own children's art school, that she returned to mosaics through teaching. "Spirit of Cancer," click to see complete mosaic. "I got my first commission with the parents of one of my students and decided that I couldn't break another tile. So I asked the clients if they would be willing to let me try a new technique and they agreed. I had enough ceramics background to figure out how to make my own tile, so I taught myself to do what I do now." Ruth's dream is a secret in the works. "I'm not really ready to share my plan with the public," she said. "But I'm hopeful you'll soon see it in action!" E-mail Ruth at ruthfgreenberg@yahoo.com. Reach Kathy at kanderson138@attbi.com, and draw on other Sketch Pads.